To configure the sending process, go to Projetex Automation Engine > Send. 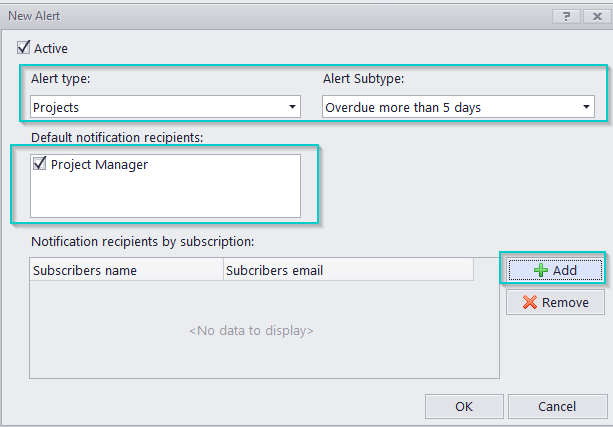 Check the 'Allow checking database and sending of e-mail notifications' checkbox. In the "SMTP" section fill the 'Server' field with the name of the server which should be used to send notifications. In case this server requires authentification, check the 'Use Authentication' checkbox and fill the appropriate fields with the required user name and password. In the "From" section, fill the appropriate fields with your personal information which will be shown to a notification recipient. Thereafter, click the 'Connection Test' button to check whether your connection settings are OK. As a confirmation you will receive 'SMTP Connection Test' letter. 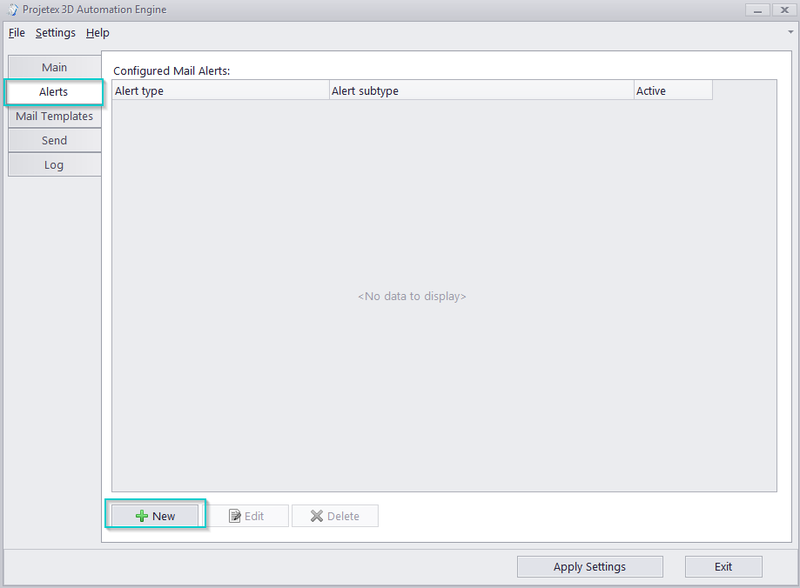 Once Projetex Automation Engine is configured, go to the Alerts section and click the Add button to add the required alert (Picture 1). 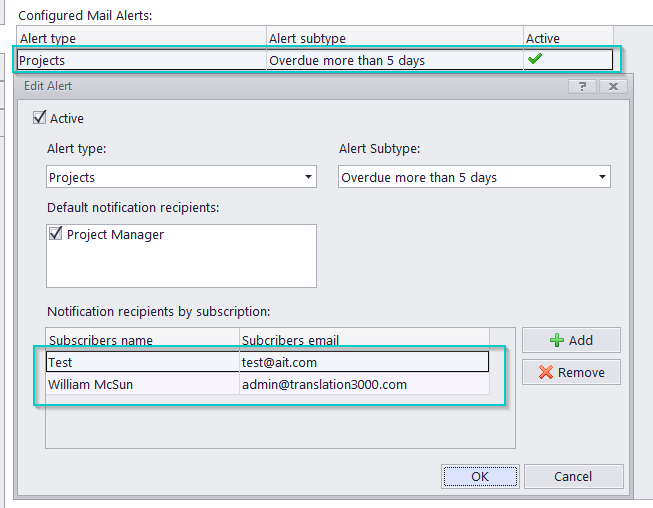 In the new window, choose the required Alert type (for example - projects), sub-type and check any default recipient types. To add additional recipients, click the Add button (Picture 2). Thereafter you will be able to choose a recipient from your Projetex users (choose only those that have an email entered and alerts enabled in their accounts) or add a new recipient by entering a custom subscriber data (Picture 3). 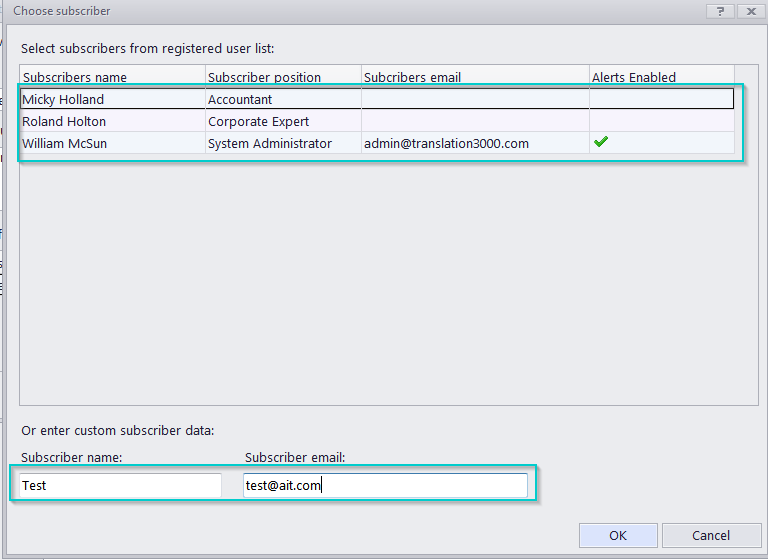 The selected subscriber from the table or the name and address from the "Custom subscriber" fields will be added to the "Notification recipients by subscription" list. Click OK to add the new alert to the list (Picture 4).